Like our other favorite, Wheat Berry and Chickpea salad, this salad is inspired by a recipe from Around the French Table, Salade Niçoise. Back in October, the Doristas made Salade Niçoise for French Fridays with Dorie. I too had assembled the salad for myself. 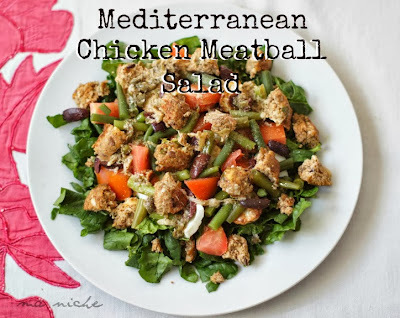 However substituting the canned tuna and anchovies with Mediterranean Chicken Meatballs, I prepared this version for my non-fish-eating husband and then tasted a spoonful of both and thought... hmmm.. "the Niçoise salad is good but this is DELICIOUS !" Ever since the has become a staple for Sunday lunch and each time we seem to enjoy it even more.. Put all the ingredients in a medium sized bowl and mix them well. I use my hands for mixing. You can however use a wooden spoon if you like. Let the mixture rest in the refrigerator for at least an hour. 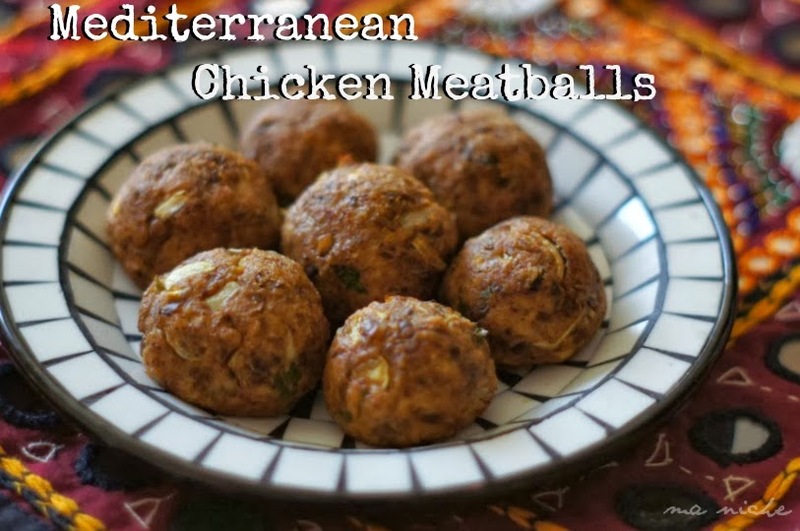 When ready to make the meatballs,line 2 baking trays with parchment paper, center a baking rack and preheat oven to 375 degrees F.
With well oiled hands, shape the refrigerated mixture into 2 inch round balls and place them on the prepared baking sheet. Since the balls do not spread much you can place them close by. I have this recipe with both green lentils and black masoor . I my opinion the one with green lentils taste better. If using black masoor, use only half the quantity as they tend to make the meatballs very dense. To make fresh bread crumbs, toast a day old bread in the oven at 400 degrees F for 8-10 minutes. Then pulverize in the food processor till you have the bread crumbs. Prepare the vinaigrette by mixing all the ingredients and let it rest for 10-15 minutes. You can either boil the potatoes in salted water or roast them in the oven. We like the taste of roasted potatoes, so if I have enough time in hand I roast it. To roast the potatoes, peel them and soak in water for at least an hour. Then toss them in oil, sprinkle salt and pepper and bake in oven at 450 degrees F for 20-22 minutes. Remove from oven and cool slightly. Cut the green beans into 3/4-1 inch long pieces. Toss them in a pot of boiling water. 6 minutes later drain the beans and run them under cold water. Pat dry and keep aside. In case you do not mind the boiled yolks, hard boil the eggs and slice them as you please for the salad. We do not like boiled yolks, so I separate the egg white and the yolks, save the yolks for later and boil the eggs whites using the method for Ruffly Poached Eggs. To assemble the salad, toss the greens in half of the vinaigrette and lay it on the plate. Then place the quartered meatballs, potatoes, green beans, tomatoes, onions and olives in any fashion you like. Season with salt and pepper and drizzle the remaining vinaigrette on top. Now serve, dig in and enjoy ! We would just love this delicious Salad! Hope you are having a great day and thank you so much for sharing with Full Plate Thursday! Your Chicken Meatball Salad looks wonderful - really flavourful and delicious. Thank you for sharing it with us at the Hearth and Soul hop. I love Mediterranean flavors and am sure I'd love these meatballs. Yum! Thanks for sharing on the weekend re-Treat link party! This looks like a delicious meal. I love mediterranean foods-and they are good for me, too! Glad you posted at the Inspire Me Monday #97 link party. I’ve pinned, liked, twittered and G+-ed your post. I’d love it if you dropped by for a visit at http://www.kneadedcreations.com . I look forward to seeing you over there! Deb @ Kneaded Creations. You know how much I like mediterranean flavoring. 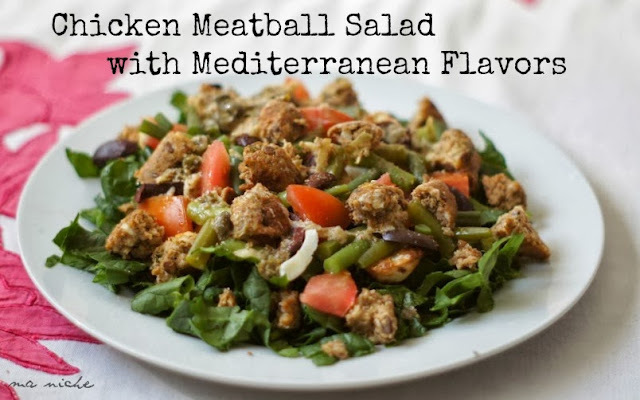 Feta in a meatball. I will have to try this. Thanks so much for sharing your dish with us on foodie friday.